After two years of frustrating fighting against a well led and professional enemy, on 5 July 1814 the United States Army gained its first major victory against British regulars in a battle fought in the open. This signal event occurred on the fields of Canadian Samuel Street's farm not far from the village of Chippawa. 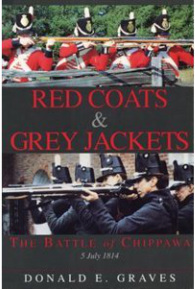 Written to promote the preservation and development of the battlefield, Red Coats and Grey Jackets is the story of the Battle of Chippawa, the opposing commanders, their troops, training and weapons, and the events of a bloody action that left seven hundred men dead or wounded. Details: Quality softcover; 6" x 9"; 202 pages; about 100 illustrations and maps; appendices with orders of battle, fatal casualties, weapons characteristics, notes, bibliography, index. "Graves's research is flawless, his prose spellbinding, and he has set a standard for battle studies that will be hard to match in the future." "an engaging and informative example of the best sort of military history being written today." "The book taken as a whole is a neat little primer on 1812 tactics and weaponry as well as the ideal tour guide booklet to the would be explorer of the battlefield." "Donald Graves establishes the battle's historical background, descibes the opposing armies, brings them inot battle, and assesses the results, without wasting a word -- yet his account of the battle combines high colour and exact detail. You find yourself alternately in the generals' boots and the privates' brogans, in all the smoke, shock and uproar of a short-range, stand-up fire fight." "Writing a battle narrative is difficult, but Graves's six chapters on the battle recount much of the fear, confusion, and human tragedy of the day. The contemporary accounts are useful, though Graves makes sure that his reader sees through the wealth of myth that has since clouded the battlefield. ...... The quality of writing and information is superb." In the Left Division's camp near the ferry station, the morning of 4 July dawned sunny and bright. During the morning, all units fired a general salute in honour of the national holiday. If there were any in the ranks who still expected to get time off for the traditional 4th of July dinner, they were sadly mistaken. Late in the morning, Brown ordered Scott to take his brigade, two companies of artillery, and Captain Samuel Harris's troop of light dragoons north to the Chippawa River. Scott was "to be governed by circumstances," but was to take "care to secure a good military position for the night." The First Brigade set off about noontime ..... [and] made good progress north on the river road. Then as now, it was a pleasant journey along the cool banks of the Niagara on a straight road shaded by tall, leafy trees. The comfortable atmosphere of the march was dispelled, however, when the brigade approached Frenchman's Creek, four miles north of Fort Erie. Harris's dragoons, who were in the advance, rode back with news that a British force was in position on the far side of the stream. These troops were commanded by Pearson who had received information about the American advance from the pickets he had posted the previous day on the river road. With Riall's agreement, he had assembled a select force and marched south hoping to delay the enemy. Pearson's command consisted of both flank companies of the 100th Foot, the light company of the 1st Foot, Lieutenant Richard S. Armstrong's two 24-pdr. guns, and a strong detachment of the 19th Light Dragoons under Lieutenant William Horton. Thomas Pearson was an experienced light infantry officer with nearly twenty years service who had seen action in Holland, Egypt, Denmark, and the West Indies before serving with Wellington in Spain. His thigh bone shattered at the battle of Albuera in 1811, he had been posted to a less demanding position in Canada as an inspecting field officer of militia, only to find himself in the middle of a hot war. The constant pain he suffered from his wound left him with an irritable disposition, and he tended to be impatient with the military pretensions of Canadian militia officers. They detested him, but Pearson could not have cared less. The veteran was in his element on this fine summer day. The recent heavy rain had flooded Frenchman's Creek and it was not fordable near its junction with the Niagara. Pearson ordered his men to tear up the floor planks of the bridge and then posted his infantry and two guns to cover the approaches to the bridge. Meanwhile Horton's dragoons took station upstream to prevent any attempt to cross the creek and outflank the British position. Coming up to the ruined bridge, Scott was forced to deploy from column of march into battle formation and to unlimber his guns to prepare for attack. Before anything got going, however, Armstrong saluted the Americans with a round from one of his two 24-pdrs., Pearson's infantry added a complementary volley, and the British then disappeared up the river road covered by Horton's dragoons. It was fortunate for Scott that the British had not had time to burn or destroy the bridge planking, but he was still delayed while he awaited repairs to the bridge. The First Brigade got underway again but, three miles to the north at Winterhoot's (now Miller's) Creek, they again found Pearson waiting on the north bank of the stream. And so it went, creek after creek, for nearly fourteen long, hot, dusty miles as the veteran Pearson did a superb job of delaying the American advance. By the late afternoon, the lead American elements had reached Street's (now Ussher's) Creek, the last stream before Chippawa. North of this was a flat, open area of farm fields extending some distance back from the river. Captain Turner Crooker of the Ninth Infantry, whose company formed the left flank guard of Scott's column, emerged from the woods upstream of the bridge. Seeing a chance to cut off the retreat of two British guns, Crooker ordered his men to cross the chest-deep stream. They emerged in an open area north of the creek. In his excitement, Crookcr had forgotten about the British dragoons. Horton, on the other hand, was vigilant and spotted the small American unit crossing the open field - unsupported by any other troops. Seeing fair game, he ordered a charge. Before the horrified eyes of the First Brigade who could see Crooker's plight but could not assist him, the blue-uniformed British dragoons swept across the farm field toward the little knot of grey-clad Americans. Keeping his head, Crooker ordered his men to fire one volley at the horsemen and then head for a nearby farmhouse. From this shelter, they knocked down eight horses and wounded four dragoons, bringing Horton's dreams of cavalry glory to a close. It was a neatly-fought little action and Scott later reported that he had "witnessed nothing more gallant in partizan war than ... the conduct of Captain Crooker and his company. Horton's charge, however, had allowed Armstrong to get his guns safely across the Chippawa. Norton and his warriors now arrived on the scene. On 4 July the previous day, they had returned to their camp near the falls and it was not until 2 p.m. that they were ordered back to Chippawa. Although Norton moved as quickly as possible, he did not reach the village until after Pearson had marched out. Moving south, the warriors soon heard "firing in our front" and then met Pearson's men north of Street's Creek. "Supposing the Americans to be in rear," Norton "hastened forward with those near me, but our Rear was influenced by the retrograde movement, and did not follow us." The warriors "remained in flank, till the Troops had passed, and then retired." As the last man crossed the bridge over the Chippawa River to safety, British engineers dropped the centre section of the rickety structure into the river.